Jack ate a dog toy and almost died. If you think a $4,000 vet bill taught him a lesson, you might be disappointed. our blue weimer ate a half of corn cob when no one was looking and it cost us $4K too, their eyes are bigger than their tummies. Wow! I feeling better about the $400 it cost to take a penny out of my old cat (1987 prices). Jasper Jak ate a rock. I didnt see him do it… I just kept finding them around the house…. and my husband wasn’t doing it. $2000. later he is fine. He’s so handsome! Thankfully, he has a good Daddy! Glad to hear Jack is ok! Luckily somce Vets are OK with payment plans….essh! My Boston terrier ate a nail! 1,200 bucks gone! But lesson learned get pet insurance! Well said – that should be a T-shirt or bumper sticker! must be a Weim thing!! Glad he’s ok! Oh my!!! 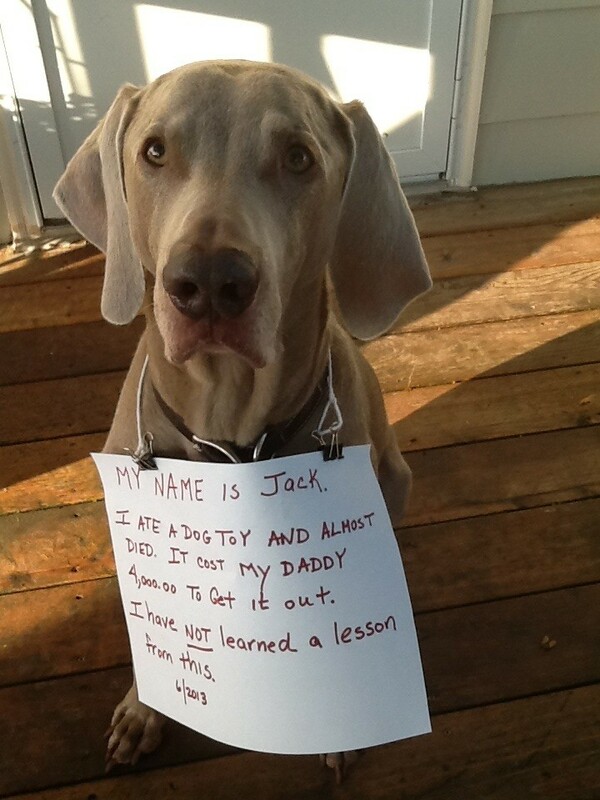 Poor Jack but even more poor Dad, you must have been out of your mind with worry. Glad Jack is well. I am feeling not so bad about our girl eating the tv remote and it only costing $800. to get the bits out of her throat. My Lab is still sensitive though when you hug her around a certain spot on her throat.